If you’ve ever dealt with a poor television signal, you’ll know just how important having a working aerial is. Getting fuzzy, broken pictures, and not being able to pick up even the basic terrestrial channels can be extremely frustrating. Though a temporary solution can be to install an inside aerial in the loft, this doesn’t always work very well as transmissions can be obstructed by stored belongings, roof materials, trees and surrounding buildings. For this reason, it’s worthwhile having a roof aerial installed. Whether this is a simple DIY project or a more challenging task will depend on the complexity of the job. For example, you might just need to fix a new aerial to an existing pole. On the other hand, your installation could involve putting in a new pole, as well as cabling. Due to the potential problems of ongoing poor transmission and faulty signals, it’s often worthwhile utilising a site like Quotatis and hiring a professional so you don’t encounter bad reception time and time again. There are quite a variety of factors that can affect TV aerial installation costs. It’s important to bear these in mind if you’re to get the best price. Location plays an important part in how much you’ll be charged to have an aerial installed. In London, you’ll pay more for contractors than in other areas of the country. The actual site of your house, the local topography and even neighbouring buildings will also have an effect on not only your signal’s strength but whether you’ll need further improvements to get the best transmission. 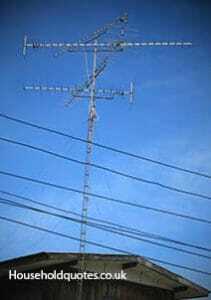 In some cases, you may discover your TV aerial pole simply isn’t mounted on a long enough pole. However, it’s important to be cautious when taking recommendations from tradesmen as it’s common for contractors to sell new poles as a way to bump the cost up. To avoid this, take the time to look at your neighbours’ aerials. If they’re all longer than normal, it suggests your area has a problem with poor signal strength and you’ll probably need to install something similar. But if everyone has a standard sized pole, then beware of tradesmen trying to recommend otherwise. If you’re having an entirely new system put in, you’ll require new cabling to route the signal from the aerial to your television. This can be one of the most costly factors because though the materials don’t actually cost a lot, cutting holes and running the cables through your house requires some skill. You might also have to do some additional cosmetic redecorating too, so this can increase overall aerial fitting costs. Depending on your location, you might not only need a longer aerial pole, but an amplifier to boost the signal. In addition, if you want more than one television plug-in point, you’ll need to split the cable correctly so you can retain a good signal strength to both outlets. Unsurprisingly, both of these factors will add a little more to your installation bill. Unfortunately, the TV aerial installation industry is rife with rogue cowboys who will offer you a cheap quote just to get the work. There are also high levels of up-selling because there’s not a lot of money to be made by simply fixing a new aerial to an existing pole. As a result, you’ll often find that installers attempt to sell you extras, such as a longer pole or new cabling when it’s not required. If you’re utilising a professional and well-respected firm, then you should expect to pay a little more. However, you can at least be confident you’re using someone who knows what they’re doing and will give you the best signal possible. Replacing a faulty TV aerial is relatively simple if the cabling and pole don’t need changing over too. It’s important to remember, however, that this DIY project will require working on the roof of your home and could be dangerous if you’re not careful. It’s a good idea to get some professional quotes first, find out what the actual problem is, and then decide whether to do the job yourself. If contractors are confident it’s only the aerial that needs changing, it’s a fairly simple process of buying a replacement and installing it. On the other hand, if cabling, amplifiers and new poles are required, hiring someone to do the work could be a better option. Luckily, the cost of having a new aerial installed is relatively low. If you only want the aerial itself replaced, you should expect to pay between £50 and £140 depending on the size of the company hired and the area you live in. For full aerial, pole, cabling and extra socket installation, costs can range from £120 to almost £300. Regardless of the scale of the project, it’s essential to do your homework and get a variety of quotes.